i need some assistance. Lets keep in mind that I'm a complete newbie at this and I wish I knew the answer, but I just don't and today, I'm not so afraid to admit that! LOL. Yesterday was a different story! When doing the actual quilting part of placemats, do I quilt it with the backing on (not reversible) or with just the top and the batting? It's a gift and I want it to look nice, but I can't figure out which is "right". The placemats are patchwork with a border. I'd post a pic, but I can't figure out how to do that. LOL. I thought I did, but I don't see it.....anyway, any help would be greatly appreciated! Thanks so much! Yeah, the picture worked! Go ahead and quilt it with the backing on it. It doesn't matter if it is reversible or not! Beautiful fabrics! Glad that you got over your shyness about asking questions here. Everyone is so helpful! For a "newbie", I must say that your points match up very well Your choice of fabric is beautiful! Whoever these placemats are for is one lucky person. Keep up the good work. Wow, thanks so much for your kind encouragement, Pinkiris....I've only made this and a baby quilt so far, but I'm loving it. I find it very relaxing. I love the fabric as well! I love your fabrics and you did a great job!! I am glad there were no pics of my first try.......certainly would not have been that pretty!! Welcome to the board and always ask...this is the most gracious group of talented people who love to help! I am amazed at what I learn everyday getting the board. Welcome to the board! Anything anyone needs to know the answer to about quilting or just about anything else for that matter, they will get the answer here! The fabrics are a big hit! And to think, I second guessed myself in the store....but I kept coming back to the flowered fabric. I hope the person who will be getting them will agree. I think she will. .
Hello, and welcome to the board. You did a beautiful job matching the points, and in you fabric choice. I have that fabric, just love it. Your work is really great!!!! Just think of it, as each placemat is a quilt ..... a small one! You go thru the process, just the same as a full sized quilt. Yes, you can bring the fabric to the front or do a separate binding. For me, I prefer the separate binding, as it gives a far nicer finish ... yes, that's only IMHO!! Your fabrics are pretty and I am sure your intended recipient will be quite impressed with your choices and work!! As you already have gotten good advice on quilting, just wanted to say your placements look great and welcome!! Welcome to the board, you did really wll. 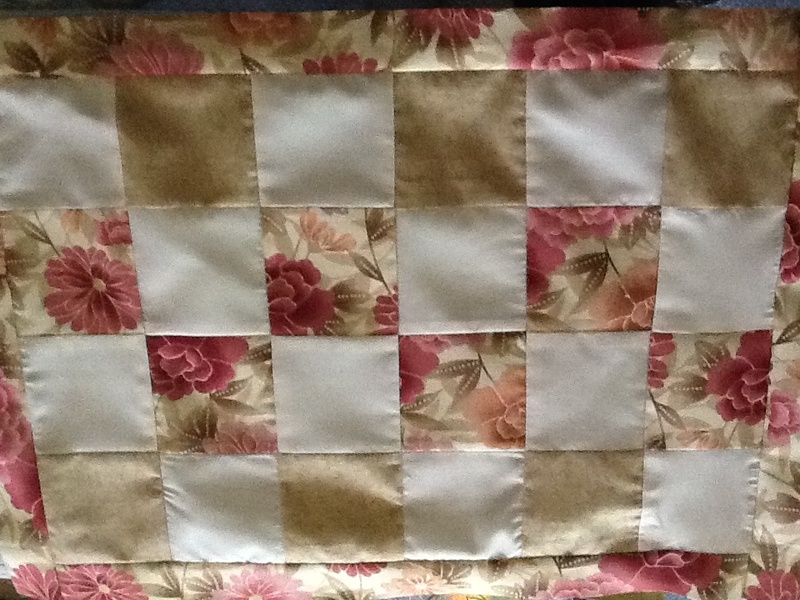 I frequently to placemats - I sandwich and pin them, then straight-line quilt diagonally. Then I bind them, as I would a quilt. It makes them reversible, too. Have fun! Ok, couple things that I think were missed. 1. Cut the backing 1 to 1.5 inches bigger than the front. You need room for everything to "draw up" a bit when you quilt it. I have cut my backing a smidge bigger like just enough to fold to the front and wouldnt you know it ended up much smaller than that....sigh. tis an annoying thing to happen. Once you finish quilting, press the whole sandwich real good, then trim down the left overs with enough to fold over to the front and stitch down. Really depends on the look you want. The second option I use when I dont have enough backing fabric to do bindings etc. Now to your comment......some fabrics, patterns, colors, quilt designs etc. speak to you. when I have a fabric that speaks like that to me, I get it. Usually those end up being the best quilts! Welcome to the board!! Just sandwich and quilt like you would anything else. It will be great! What a pretty placemat! Good work too! Let us see the finished placemats too, please! I really appreciate all of the support! Yesterday, I wanted to quit.....I was feeling that they were good enough to give as a gift, but the friend who will be getting them is very gracious and I know they will mean a lot to her. I have to keep reminding myself that I am just beginning and the Rome wasn't built in a day, right? I'm hoping to post a pic of one completed one today. I've decided to put my own binding on instead of bringing it around from the back. Thanks again for all your kind words! They mean a lot to me as a new quilter! Quilt it with the backing on. That is very pretty colors.